Posted January 18th, 2019 by alexa & filed under Families. I’m often asked what the best thing is about being a professional London photographer. It’s such a hard question, as I can honestly say I love most things about it. Of course, as with any job, there are things I’m not so keen on. When I decided to turn my passion of photography into my career I pictured myself spending most days out in the beautiful sunshine. I could see myself wandering through glorious parks with fantastic families (this bit is true!) All my days would be filled with low sunshine, glorious light, walking barefoot in the grass…. you get the picture! What I didn’t imagine was how many hours would be spent in front of the computer. Days spent editing, marketing, designing albums, keeping up with social media, ordering prints and frames. I don’t mind doing all this, but I never realised how long it would all take. Being a photographer is never, ever dull! Sorry if this is sounding a bit negative, it’s really not supposed to! I feel so lucky to have a job as a family and wedding photographer. And going back to the original question of the best thing about being a professional photographer. Well it has to be the variety of the shoots I do. There are literally no two jobs the same. One day I’ll be photographing a 5-day old baby, the next I’ll be doing a corporate headshot session in the City. On the Saturday I’ll be enjoying taking photos at a wedding in the Oxo Tower. On the Sunday I’ll be at the Royal College of Music photographing a talented young musician. 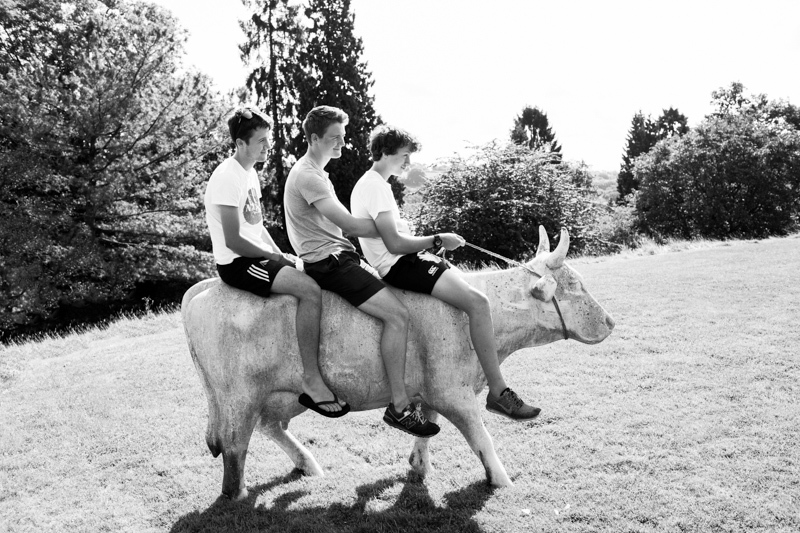 And when I turn up at a family home to get some natural, relaxed portraits I never think I’ll be photographing three teenagers sitting on a cow! It might not have been a real cow, but it was still a cow! This family session with three fantastic teenage boys was so much fun. And this moment was so unique and I just had to share it!